In fluid dynamics, Airy wave theory (often referred to as linear wave theory) gives a linearised description of the propagation of gravity waves on the surface of a homogeneous fluid layer. The theory assumes that the fluid layer has a uniform mean depth, and that the fluid flow is inviscid, incompressible and irrotational. This theory was first published, in correct form, by George Biddell Airy in the 19th century. Airy wave theory is often applied in ocean engineering and coastal engineering for the modelling of random sea states – giving a description of the wave kinematics and dynamics of high-enough accuracy for many purposes. Further, several second-order nonlinear properties of surface gravity waves, and their propagation, can be estimated from its results. Airy wave theory is also a good approximation for tsunami waves in the ocean, before they steepen near the coast. This linear theory is often used to get a quick and rough estimate of wave characteristics and their effects. This approximation is accurate for small ratios of the wave height to water depth (for waves in shallow water), and wave height to wavelength (for waves in deep water). Dispersion of gravity waves on a fluid surface. Phase and group velocity divided by √(gh) as a function of h/λ. A: phase velocity, B: group velocity, C: phase and group velocity √(gh) valid in shallow water. Drawn lines: based on dispersion relation valid in arbitrary depth. Dashed lines: based on dispersion relation valid in deep water. Airy wave theory uses a potential flow (or velocity potential) approach to describe the motion of gravity waves on a fluid surface. The use of – inviscid and irrotational – potential flow in water waves is remarkably successful, given its failure to describe many other fluid flows where it is often essential to take viscosity, vorticity, turbulence and/or flow separation into account. This is due to the fact that for the oscillatory part of the fluid motion, wave-induced vorticity is restricted to some thin oscillatory Stokes boundary layers at the boundaries of the fluid domain. Airy wave theory is often used in ocean engineering and coastal engineering. Especially for random waves, sometimes called wave turbulence, the evolution of the wave statistics – including the wave spectrum – is predicted well over not too long distances (in terms of wavelengths) and in not too shallow water. Diffraction is one of the wave effects which can be described with Airy wave theory. Further, by using the WKBJ approximation, wave shoaling and refraction can be predicted. Earlier attempts to describe surface gravity waves using potential flow were made by, among others, Laplace, Poisson, Cauchy and Kelland. But Airy was the first to publish the correct derivation and formulation in 1841. Soon after, in 1847, the linear theory of Airy was extended by Stokes for non-linear wave motion – known as Stokes' wave theory – correct up to third order in the wave steepness. Even before Airy's linear theory, Gerstner derived a nonlinear trochoidal wave theory in 1802, which however is not irrotational. The angular wavenumber k and frequency ω are not independent parameters (and thus also wavelength λ and period T are not independent), but are coupled. Surface gravity waves on a fluid are dispersive waves – exhibiting frequency dispersion – meaning that each wavenumber has its own frequency and phase speed. valid in the present case of linear periodic waves. Orbital motion under linear waves. The yellow dots indicate the momentary position of fluid particles on their (orange) orbits. The black dots are the centres of the orbits. Underneath the surface, there is a fluid motion associated with the free surface motion. While the surface elevation shows a propagating wave, the fluid particles are in an orbital motion. Within the framework of Airy wave theory, the orbits are closed curves: circles in deep water, and ellipses in finite depth—with the ellipses becoming flatter near the bottom of the fluid layer. So while the wave propagates, the fluid particles just orbit (oscillate) around their average position. With the propagating wave motion, the fluid particles transfer energy in the wave propagation direction, without having a mean velocity. The diameter of the orbits reduces with depth below the free surface. In deep water, the orbit's diameter is reduced to 4% of its free-surface value at a depth of half a wavelength. In a similar fashion, there is also a pressure oscillation underneath the free surface, with wave-induced pressure oscillations reducing with depth below the free surface – in the same way as for the orbital motion of fluid parcels. Boundary conditions are needed at the bed and the free surface in order to close the system of equations. For their formulation within the framework of linear theory, it is necessary to specify what the base state (or zeroth-order solution) of the flow is. Here, we assume the base state is rest, implying the mean flow velocities are zero. In case of deep water – by which is meant infinite water depth, from a mathematical point of view – the flow velocities have to go to zero in the limit as the vertical coordinate goes to minus infinity: z → -∞. Because this is a linear theory, in both free-surface boundary conditions – the kinematic and the dynamic one, equations (3) and (4) – the value of Φ and ∂Φ/∂z at the fixed mean level z = 0 is used. with tanh the hyperbolic tangent. So angular frequency ω and wavenumber k – or equivalently period T and wavelength λ – cannot be chosen independently, but are related. This means that wave propagation at a fluid surface is an eigenproblem. When ω and k satisfy the dispersion relation, the wave amplitude a can be chosen freely (but small enough for Airy wave theory to be a valid approximation). In the table below, several flow quantities and parameters according to Airy wave theory are given. The given quantities are for a bit more general situation as for the solution given above. Firstly, the waves may propagate in an arbitrary horizontal direction in the x = (x,y) plane. The wavenumber vector is k, and is perpendicular to the cams of the wave crests. Secondly, allowance is made for a mean flow velocity U, in the horizontal direction and uniform over (independent of) depth z. This introduces a Doppler shift in the dispersion relations. At an Earth-fixed location, the observed angular frequency (or absolute angular frequency) is ω. On the other hand, in a frame of reference moving with the mean velocity U (so the mean velocity as observed from this reference frame is zero), the angular frequency is different. It is called the intrinsic angular frequency (or relative angular frequency), denoted as σ. So in pure wave motion, with U=0, both frequencies ω and σ are equal. The wave number k (and wavelength λ) are independent of the frame of reference, and have no Doppler shift (for monochromatic waves). The table only gives the oscillatory parts of flow quantities – velocities, particle excursions and pressure – and not their mean value or drift. The oscillatory particle excursions ξx and ξz are the time integrals of the oscillatory flow velocities ux and uz respectively. intermediate depth – all other cases, 1⁄20 λ < h < ½ λ, where both water depth and period (or wavelength) have a significant influence on the solution of Airy wave theory. In the limiting cases of deep and shallow water, simplifying approximations to the solution can be made. While for intermediate depth, the full formulations have to be used. Dispersion of gravity–capillary waves on the surface of deep water. Phase and group velocity divided by as a function of inverse relative wavelength . Blue lines (A): phase velocity cp, Red lines (B): group velocity cg. Dash-dot lines: pure capillary waves. As a result of surface tension, the waves propagate faster. Surface tension only has influence for short waves, with wavelengths less than a few decimeters in case of a water–air interface. For very short wavelengths – two millimeter or less, in case of the interface between air and water – gravity effects are negligible. Note that surface tension can be altered by surfactants. The group velocity ∂Ω/∂k of capillary waves – dominated by surface tension effects – is greater than the phase velocity Ω/k. This is opposite to the situation of surface gravity waves (with surface tension negligible compared to the effects of gravity) where the phase velocity exceeds the group velocity. Surface waves are a special case of interfacial waves, on the interface between two fluids of different density. where ρ and ρ‘ are the densities of the two fluids, below (ρ) and above (ρ‘) the interface, respectively. Further γ is the surface tension on the interface. For interfacial waves to exist, the lower layer has to be heavier than the upper one, ρ > ρ‘. Otherwise, the interface is unstable and a Rayleigh–Taylor instability develops. Wave motion on the interface between two layers of inviscid homogeneous fluids of different density, confined between horizontal rigid boundaries (at the top and bottom). The motion is forced by gravity. The upper layer has mean depth h‘ and density ρ‘, while the lower layer has mean depth h and density ρ. The wave amplitude is a, the wavelength is denoted by λ (related to the wavenumber k by: k = 2π / λ), the gravitational acceleration by g and the phase speed as cp (with cp = Ω(k) / k). where again ρ and ρ′ are the densities below and above the interface, while coth is the hyperbolic cotangent function. For the case ρ′ is zero this reduces to the dispersion relation of surface gravity waves on water of finite depth h.
In this case the dispersion relation allows for two modes: a barotropic mode where the free surface amplitude is large compared with the amplitude of the interfacial wave, and a baroclinic mode where the opposite is the case – the interfacial wave is higher than and in antiphase with the free surface wave. The dispersion relation for this case is of a more complicated form. Several second-order wave properties, i.e. quadratic in the wave amplitude a, can be derived directly from Airy wave theory. They are of importance in many practical applications, e.g. forecasts of wave conditions. Using a WKBJ approximation, second-order wave properties also find their applications in describing waves in case of slowly varying bathymetry, and mean-flow variations of currents and surface elevation. As well as in the description of the wave and mean-flow interactions due to time and space-variations in amplitude, frequency, wavelength and direction of the wave field itself. In the table below, several second-order wave properties – as well as the dynamical equations they satisfy in case of slowly varying conditions in space and time – are given. More details on these can be found below. The table gives results for wave propagation in one horizontal spatial dimension. Further on in this section, more detailed descriptions and results are given for the general case of propagation in two-dimensional horizontal space. The last four equations describe the evolution of slowly varying wave trains over bathymetry in interaction with the mean flow, and can be derived from a variational principle: Whitham's averaged Lagrangian method. In the mean horizontal-momentum equation, d(x) is the still water depth, i.e. the bed underneath the fluid layer is located at z = –d. Note that the mean-flow velocity in the mass and momentum equations is the mass transport velocity , including the splash-zone effects of the waves on horizontal mass transport, and not the mean Eulerian velocity (e.g. as measured with a fixed flow meter). with an overbar denoting the mean value (which in the present case of periodic waves can be taken either as a time average or an average over one wavelength in space). with γ the surface tension. is the mean-velocity shear-rate tensor. with and the components of the wavenumber vector and similarly and the components in of the mean velocity vector . Stokes second definition of wave celerity (S2) – with the mean mass transport equal to zero. The above relation between wave momentum M and wave energy density E is valid within the framework of Stokes' first definition. However, for waves perpendicular to a coast line or in closed laboratory wave channel, the second definition (S2) is more appropriate. These wave systems have zero mass flux and momentum when using the second definition. In contrast, according to Stokes' first definition (S1), there is a wave-induced mass flux in the wave propagation direction, which has to be balanced by a mean flow U in the opposite direction – called the undertow. So in general, there are quite some subtleties involved. Therefore also the term pseudo-momentum of the waves is used instead of wave momentum. Note that for deep water, when the mean depth h goes to infinity, the mean Eulerian velocity and mean transport velocity become equal. Note that mean horizontal momentum is only conserved if the sea bed is horizontal (i.e. the still-water depth d is a constant), in agreement with Noether's theorem. with the angular frequency ω a function of the (angular) wavenumber k, related through the dispersion relation. For this to be possible, the wave field must be coherent. By taking the curl of the wave-crest conservation, it can be seen that an initially irrotational wavenumber field stays irrotational. so it varies as a function of elevation. The given formula is for Stokes first definition of wave celerity. When is integrated over depth, the expression for the mean wave momentum is recovered. Boussinesq approximation (water waves) – nonlinear theory for waves in shallow water. Wave power – using ocean and sea waves for power generation. 1 2 3 Craik (2004). 1 2 Goda, Y. (2000). Random Seas and Design of Maritime Structures. Advanced Series on Ocean Engineering. 15. Singapore: World Scientific Publishing Company. ISBN 981-02-3256-X. OCLC 45200228. ↑ Dean & Dalrymple (1991). ↑ Phillips (1977), §3.2, pp. 37–43 and §3.6, pp. 60–69. ↑ Lighthill, M. J. (1986). "Fundamentals concerning wave loading on offshore structures". J. Fluid Mech. 173: 667–681. Bibcode:1986JFM...173..667L. doi:10.1017/S0022112086001313. 1 2 3 4 For the equations, solution and resulting approximations in deep and shallow water, see Dingemans (1997), Part 1, §2.1, pp. 38–45. Or: Phillips (1977), pp. 36–45. ↑ The error in the phase speed is less than 0.2% if depth h is taken to be infinite, for h > ½ λ. ↑ The error in the phase speed is less than 2% if wavelength effects are neglected for h < 1⁄20 λ. 1 2 Phillips (1977), p. 37. ↑ Lighthill (1978), p. 223. ↑ Phillips (1977), p. 175. ↑ Lamb, H. (1994), §267, page 458–460. ↑ Dingemans (1997), Section 2.1.1, p. 45. ↑ See for example: the High seas forecasts of NOAA's National Weather service. 1 2 3 4 5 Whitham, G.B. (1974). Linear and nonlinear waves. Wiley-Interscience. ISBN 0-471-94090-9. OCLC 815118. , p. 559. ↑ Phillips (1977), p. 23–25. 1 2 Phillips (1977), p. 39. 1 2 Phillips (1977), p. 38. ↑ Lord Rayleigh (J. W. Strutt) (1877). "On progressive waves". Proceedings of the London Mathematical Society. 9: 21–26. doi:10.1112/plms/s1-9.1.21. Reprinted as Appendix in: Theory of Sound 1, MacMillan, 2nd revised edition, 1894. 1 2 Phillips (1977), p. 26. ↑ Bretherton, F. P.; Garrett, C. J. R. (1968). "Wavetrains in inhomogeneous moving media". Proceedings of the Royal Society of London, Series A. 302 (1471): 529–554. Bibcode:1968RSPSA.302..529B. doi:10.1098/rspa.1968.0034. ↑ Phillips (1977), pp. 179–183. ↑ Phillips (1977), pp. 70–74. ↑ Phillips (1977), p. 66. ↑ Phillips (1977), p. 68. ↑ Phillips (1977), pp. 39–40 & 61. ↑ Phillips (1977), p. 40. ↑ Phillips (1977), p. 70. ↑ McIntyre, M. E. (1978). "On the 'wave-momentum' myth". Journal of Fluid Mechanics. 106: 331–347. Bibcode:1981JFM...106..331M. doi:10.1017/S0022112081001626. 1 2 3 Phillips (1977), pp. 61–63. ↑ Phillips (1977), p. 23. ↑ LeBlond, P.H. ; Mysak, L A. (1981). Waves in the Ocean. Elsevier Oceanography Series. 20. Elsevier. pp. 85 & 110–111. ISBN 978-0-444-41926-2. ↑ Craik, A.D.D. (1988). Wave interactions and fluid flows. Cambridge University Press. p. 105. ISBN 978-0-521-36829-2. 1 2 Phillips (1977), p. 44. Airy, G. B. (1841). "Tides and waves". In Hugh James Rose, et al. Encyclopædia Metropolitana. Mixed Sciences. 3 (published 1817–1845). CS1 maint: Uses editors parameter (link) Also: "Trigonometry, On the Figure of the Earth, Tides and Waves", 396 pp. Stokes, G. G. (1847). "On the theory of oscillatory waves". Transactions of the Cambridge Philosophical Society. 8: 441–455. Reprinted in: Stokes, G. G. (1880). Mathematical and Physical Papers, Volume I. Cambridge University Press. pp. 197–229. Craik, A. D. D. (2004). "The origins of water wave theory". Annual Review of Fluid Mechanics. 36: 1–28. Bibcode:2004AnRFM..36....1C. doi:10.1146/annurev.fluid.36.050802.122118. Dean, R. G.; Dalrymple, R. A. (1991). Water wave mechanics for engineers and scientists. Advanced Series on Ocean Engineering. 2. Singapore: World Scientific. ISBN 978-981-02-0420-4. OCLC 22907242. Dingemans, M. W. (1997). Water wave propagation over uneven bottoms. Advanced Series on Ocean Engineering. 13. Singapore: World Scientific. ISBN 981-02-0427-2. OCLC 36126836. Two parts, 967 pages. Lamb, H. (1994). Hydrodynamics (6th ed.). Cambridge University Press. ISBN 978-0-521-45868-9. OCLC 30070401. Originally published in 1879, the 6th extended edition appeared first in 1932. Landau, L. D.; Lifschitz, E. M. (1986). Fluid mechanics. Course of Theoretical Physics. 6 (2nd revised ed.). Pergamon Press. ISBN 0-08-033932-8. OCLC 15017127. Lighthill, M. J. (1978). Waves in fluids. Cambridge University Press. ISBN 0-521-29233-6. OCLC 2966533. 504 pp. Phillips, O. M. (1977). 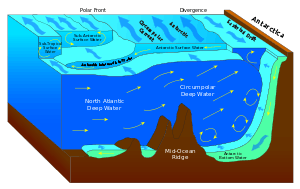 The dynamics of the upper ocean (2nd ed.). Cambridge University Press. ISBN 0-521-29801-6. OCLC 7319931. Linear theory of ocean surface waves on WikiWaves.